Candle lighting by Armenia’s Coalition to Stop Violence against Women on 1 October 2017. The posters feature victims of domestic violence. Photo courtesy of Zaruhi Hovhannisyan. All rights reserved. This October, the Armenian government redeveloped its draft law on preventing domestic violence and opened it for public discussion. This started heated debates between state representatives and several groups who oppose the law. Women’s organisations and domestic violence survivors have been left on the periphery of a male-dominated vicious circle, and the draft law has been artificially turned from a preventive and protective tool into a mechanism for “family reconciliation” between abusers and survivors. Domestic violence remains a prevalent problem for Armenian society. Despite the latent character of the issue and women’s reluctance to seek refuge from abusive relationships, as of October 2017, there were 602 cases of domestic violence officially registered by the Armenian police this year. Women’s rights NGOs received around 5,000 hotline calls. In its most cruel form of power and subjugation, femicide in Armenia continues to demonstrate the systemic oppression of women. Between 2010-2017, at least 50 women were killed by their partners or ex-partners, often on the grounds of “male jealousy”. These crimes were not properly punished, and were justified even on the level of court judgements. Thanks to increasing media attention towards violence against women and the fact that more survivors are empowered to speak up about their abuse, the number of known cases of domestic violence is increasing, breaking the hindering silence around these unpunished and normalised crimes. Not so long ago, members of the ruling Republican Party of Armenia were denying the existence of domestic violence in the country. For instance, in 2014, Eduard Sharmazanov, current Vice President of the National Assembly, stated: “There is no issue of violence against women as Armenians are a nation that honours mothers”. Three years on, the government seems to have “recognised” the need for protective legislation. “The public demand for this kind of law has existed for a while... The current legislation does not ensure effective and necessary mechanisms to protect and support victims and to prevent domestic violence,” remarked Armenia’s Minister of Justice Davit Harutyunyan on 1 November. The redevelopment of the draft of domestic violence law by the Armenian government, however, is neither an indication of its sudden increased awareness of the issue — nor the magical manifestation of political will. Will women’s rights organisations fight for the final adoption of the law in its current format? Or will they call for its total dismissal? Under its Human Rights Budget Support Program, the European Commission has made an €11m grant to the Armenian government. One of the conditions of the grant’s provision was the adoption of a standalone law on domestic violence. This conditionality can be attributed to the persistent advocacy and lobbying efforts of Armenian women’s rights organisations, which have worked on the law since 2007. Their initial efforts resulted in the draft law being rejected by the Armenian parliament in 2013. This decade-long struggle eventually led to the new draft redeveloped by the government this year. But this work also triggered an artificially produced public controversy and media manipulation. 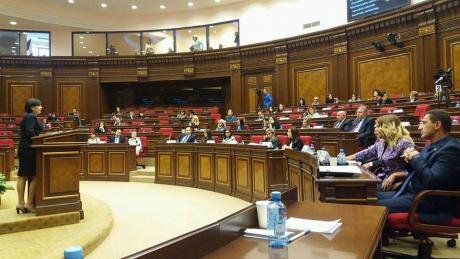 The first public hearing on Armenia’s new domestic violence draft law took place in Yerevan on 9 October. After state representatives finished their public speeches and presentations, several groups, angry and dissatisfied with the Q&A format of the agenda, attempted to take the stage. Some members of these groups distributed leaflets in Russian containing information on the differences between Russian and western values in relation to domestic violence legislation. One woman, who had spoken to the Minister of Justice in Russian, condemned the work of a diaspora Armenian women’s rights defender. “You are not Armenian!” she told Maro Matosyan, the director of the Women’s Support Center, which has run a shelter for women survivors of domestic violence for many years. Groups opposing the law on domestic violence attempt to hijack the first public hearing. Photo courtesy of Lara Aharonian. All rights reserved. In this state of turmoil, the floor was given to the Primate of Shirak Diocese of Armenian Apostolic Church Bishop Mikayel Ajapahyan who tried to calm down all sides, stressing the importance of Christian education to prevent violence and encouraging the audience not to seek conspiracy in the draft legislation. Semi-satisfied, few, if any, participants questioned the fact that neither women’s rights organisations, nor domestic violence survivors were given the floor to express their deep concerns and disagreements on the draft law. The absence of radical criticism by women’s rights groups made it appear as if their standpoint aligned with that of the state. As a result, instead of demanding improvements, for women’s groups, the fight was lowered to merely preserving the current draft, which not only fails to criminalise domestic violence, but also contains a number of problematic provisions. For instance, the draft law includes a “mediation clause” that gives abusers the opportunity to reconcile with survivors via an “independent body” called a “Support Centre”. This is a clause that makes the Armenian domestic violence draft law distinct from other countries’ similar legislation as the state starts fulfilling a function of a reconciliation institution. The draft does not envisage serious punishment for non-compliance with the protection and restraining orders or for revealing a shelter’s location. It also suggests creating a council to oversee the law’s implementation. The council members would, however, be appointed by the Prime Minister, thus completely discrediting the council’s independence. These and several other problematic clauses were not widely criticised, and the discussion became an attempt to “justify” (or “disprove”) the need for legislative changes to struggle against domestic violence as a serious trouble for Armenian society. During the second public hearing, several individuals who were active in the 2013 anti-gender movements and proven to be backed by Russia, delivered speeches in the Armenian parliament. 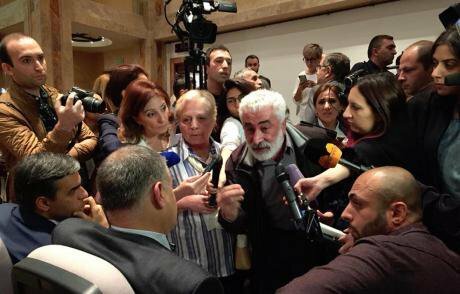 “This law envisages manipulations and blackmailing,” stated Arman Boshyan, the coordinator of Pan-Armenian Parents’ Committee, and president of the Yerevan Geopolitical Club, a group aimed at strengthening Russia’s political influence in Armenia. In fact, the domestic violence draft law was condemned by “opposition” groups, as well as by a wider public affected by their misinformation, for being a “new” mechanism to take children from their parents and give them to state-run shelters. The manipulations from these groups and the media were so intense that little, if any, attention was paid to the fact that such a clause (Article 43.2) already exists in the Armenian Family Code. As to the draft law on domestic violence, it neither envisages any mechanisms for taking children away nor opens shelters for children. Hasmik Khachatryan, a survivor of domestic violence, shares her story before Armenia’s parliament. Photo (c): Anna Nikoghosyan. All rights reserved. At the second public hearing on the draft law in parliament, Arman Ghukasyan, the director of International Humanitarian Development, an NGO whose profile is impossible to find online, stated: “Women’s NGOs have an interest in the high rate of domestic violence cases in order to be able to receive more grants.” Despite the fact that none of the people opposing the legislation was a professional working in the field of domestic violence or a related area, the opinions of these groups were seriously taken into account both by state representatives and the media. In this environment of “suddenly emerging” deep expertise on domestic violence, Hasmik Khachatryan, a survivor of domestic violence who was subject to violence by her husband for nine years and whose abuser received an amnesty and was set free, shared her story in parliament. As Khachatryan highlighted, the first time the investigator came to see her, he recommended her to return to her husband: “Women should obey their husbands when they beat them, he told me.” As she stressed the importance of the law, she referred to many women who live in a constant state of fear and do not know how to seek help. Despite Hasmik’s powerful speech, which was accompanied by applause, the draft was not saved from further distortions by the government. In the middle of complying with the EU’s budget support programme and menace from Russian-backed campaigning against the law, the Armenian government decided to make dramatic changes in the draft, including its title. Hence, on 16 November, the government quickly and silently approved the draft law and presented it to the National Assembly. The new draft is now entitled “Preventing violence in the family, protecting the victims of violence in the family and restoring harmony in the family”. As the new title and changed provisions suggest, this law shifts the focus from protecting individuals and preventing crime to “reconciling the family”. According to members of the Armenian Coalition to Stop Violence against Women, a unity of NGOs fighting for the adoption of the law, this concept “not only lacks a legal definition, but also contradicts local and international legal norms”. Furthermore, the term “domestic violence” has been switched out for “violence in the family”, thus narrowing the targets of the law. One of the principles enshrined in the new draft is now the strengthening of “traditional family values”, while one of the actions prescribed by the law is a review of educational materials to include information on values in “traditional families”. As Anahit Simonyan, a women’s rights defender, told me: “Legislation exists so that relationships between people are regulated on the basis of laws, not traditions.” The approved draft, however, does not question Armenian traditions — the root causes of women’s violence and oppression. Instead, it perpetuates them. The Armenian government continues to be influenced by political groups whose agenda seems to align with their own politics. It is ignoring the advice of experts from the field of domestic violence and voices of domestic violence survivors — the people who should be at the frontline of these discussions. 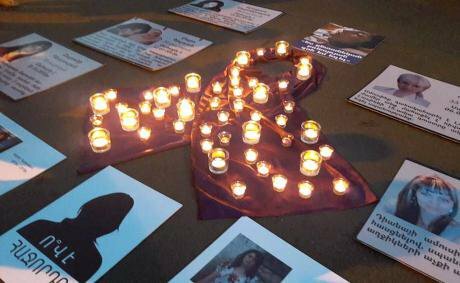 Both the effectiveness and necessity of a law that risks aggravating the situation, rather than becoming a support mechanism for survivors, are questionable. Will women’s rights organisations fight for the final adoption of the law in its current format? Or will they call for its total dismissal? This remains uncertain. But one thing is clear: Armenia’s patriarchal state bodies are nurturing laws and policies that reflect their values — and keep getting paid for it. Even at the EU level.